Discussion in 'Muppet Appearances' started by Phillip, Mar 21, 2012. Tonight's the night! 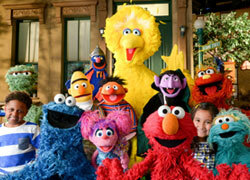 Watch everyone's favorite band, Dr. Teeth and The Electric Mayhem rock out on Jimmy Kimmel Live on ABC. They’ll be joined by Travis Barker, drummer for Blink-182 and The Aquabats. After you see the anticipated appearance, post here and let us know your thoughts. sharonbale, The Count, beatnikchick300 and 2 others like this. YEAAAAAAAAAAAAA Rock on rock rock on! everything i wanted to see and hear and ohh ohh so much more! They performed "Can You Picture That" and Animal and Travis Barker had a drum battle during the instrumental and even though Travis won Animal did to him what he did to Buddy Rich on TMS! YAY FOR DOCTOR TEETH AND THE ELECTRIC MAYHEM!!!!!!!! It was awesome! I don't even regret staying up till 1 in the morning (though I am sleepy). Thanks to seeing the thread around 12:30 AM EST, I remembered about the appearance. Turned it on and sat through the two interviews... And then it happened! Dr. Teeth and the Electric Mayhem singing Can You Picture That? with their new Muppeteers. Oh, this was like so psychadelic! And yes, Travis Barker was there to try and upstage Animal in an extended drum solo battle. Guess who won. Now more than ever, especially after this gig, I want the people in charge to push harder to get the Mayhem on noted Muppet friend Jimmy Fallan's talk show in Christmas 2012 to perform Little Saint Nick. Make it happen. Like, fer sure. What a great performance!! Who thinks Dr. Teeth & the Electric Mayhem should go on tour? I would SOOO be there! The Electric Mayhem was awesome!! This is the performance people expected when Animal made that talk show appearance last year. They're either listening to us or we lucked out! theprawncracker, KermieBaby47 and The Count like this. Jamie, is that last IMG link supposed to be Lips? Muppetfan44, Scooterfan5, Nasubionna and 3 others like this. Wow!!! Bill Baretta knocked this one out of the park!! He was OUTSTANDING as Dr. Teeth - never has he been so close to Jim's version. This put a huge smile on my face! This is SO FREAKING AWESOME I can barely see straight to type this!!! 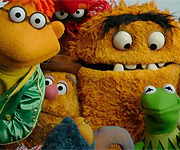 One of the things that has excited me the most about the Muppet renaissance of the last five years is the full-force return of beloved elements like The Electric Mayhem - they sounded fabulous on A Green and Red Christmas and absolutely NAILED this classic TMM song (on Jimmy Kimmel Live no less! I can't believe how kind Jimmy and his people are to the Muppets! He even interviewed Big Bird! BIG BIRD, I tell you!!!). Bottom line...this continues the trend of wonderfully-creative uses of the Muppets to promote the home release of the new movie, rather than just having one of them show up and do a basic plug...Am I happy? POSS-A-LUTELY!!! Yes, David Rudman has taken over for both Janice and Scooter , Richard's main characters. Thank you Count...I figured that was Rudman. At least he's got her sounding more like Janice from TMS Season 2 onward and not TMS Season 1 (with all due respect to Erin Ozker - I just wasn't a fan of that voice affectation, that's all). Amazing. AMAZING. I hope these guys know how good they are! !